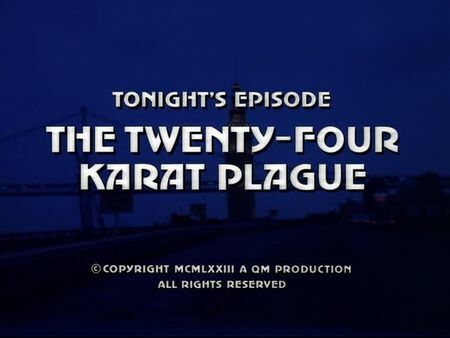 I have just added the screencaps for The Twenty-Four Karat Plague to the episodes' page. Four men heist a transport of decayed radioactive gold in order to mint rare gold coins. One of the transport drivers suffers a heart-attack and later dies in the hospital. Our two cops are in a race against time as the robbers are obviously unaware of the deadly transport they have stolen - in opposite to regular disposal transports of the University, these particular gold samples were mixed with highly-radioactive Uranium. Then they find out the truth about their treasure, but the man smelting and forming the planchets already suffers from radiation poisoning and is going to die. Two of the henchmen have nagging doubts about what they did, but the fourth one is ready to carry it to extremes and to sell the contaminated gold to a Chinese dealer. The openening sequence offers an interesting insight into research handling of radioactive materials at the 'California Northern University'. It actually is San Francisco State University located between Lake Merced and 19th Avenue; the screenplay probably dubbed the institution 'California Northern University' in order to explain why the transport approached San Francisco from the North, passing the toll station of Golden Gate Bridge - or just because the Bay Area ist located in Northern California. Soon after, they almost have a car collision with Mike and Steve at Marina and Buchanan after our two cops came down from Johnny Porter's 007 1/2 Bar at Lombard and Scott. We are also taken to the Industrial Harbour south of the Bay Bridge where they hide the transport and try to smelt and form the coins. Interestingly, the henchmen are all living very close together, on Russian Hill. Lew Morrison's burger restaurant 'Clown Alley' is located at the intersection of Lombard and Divisadero, and some investigation work takes us downtown to One Embarcadero Center (Charlie Durand's office) as well as to Union Square (where Vic meets Eddie who is delivering flowers with his truck in front of the 'City of Paris' fashion store). By the way, Mike has that funny questioning with a car-park attendant (who revs the Ford Mustang's engine and tires) which took place at a no longer existing parking lot on Battery Street. The climax takes us to Chinatown's Grant Avenue for both, the Chinese store where Vic sells the gold specimen as well as the famous 'Dragon Gate' at Bush and Grant where Vic is hit to death by a van. On a funny note, Vic Tolliman uses a back entrance when the police arrives at the store, however, the actual scene in the back alley was filmed on Spofford Street which is two blocks away.